I have loved stories who blur the boundaries between humans and animals since I read Philipp Pullman’s Dark Materials series. They restore—even by mean of Fantasy—a sense of connection with Nature, an acknowledgement that we share a fundamental experience—life on this Planet—with other creatures, and that we do have the ability to develop a connection with others. Scion of the Fox fits right next to Pullman’s series on the shelf. In this novel, animals spirits walk amongst humans: they protect the fragile balance of the world by carrying a role based on their strength and wisdom. They can also initiate and mentor humans to join the fight. It’s a truly original, enthralling, and well-developed universe. Note that the novel is the first opus of a series called Realms of the Ancient, and that the book’s ending is a sad reminder of it (worst than a cliffhanger, as you’ll read further down). However, it happens in Winnipeg, Canada and I really, really enjoyed that! So, the story focuses on Roan Harken, an orphan who lives at her grandmother’s place with her aunt and uncle. So far, the biggest concern in her life has been a constantly-infected left eye, which makes her very self-conscious at school, and a preternatural social awkwardness. One day, she discovers a corpse in the snow, then her left eye comes close to escape its socket by its own will, then she literally meets Death, as well as a Fox spirit whom she chases in the street in the dead of the night. And if that wasn’t enough, she soon learns that she is expected to sacrifice herself to the Assiniboine river… or see the destruction of Winnipeg! The best part of the book is definitely the world-building: Beiko imagined a whole cosmogony which I’m not sure I totally understood, but it involves a now very sleepy Creator called Ancient, animal factions (Owl, Fox, Deer, Seal), and an irate monster trapped under the Assiniboine River. My favourite aspect of the story was obviously the Animal families and how their members were sneaking amongst humans, discreetly working to keep the world balanced against destruction (which I liked much better than the old-fashioned good-vs-evil pattern). I loved that each Family had characteristic traits: for instance Foxes are, unsurprisingly, good with fire and cunning. I only wish I could have grasped the exact nature of Ancient better, and that some aspects of the book were more developed, such as the forces of Destruction (do they have Families too?) and the Seal Family. Unfortunately, the story was let down by a number of things. For one, Roan and her friends are truly lovely and funny characters, but their development felt very rushed as the team had to meet, wrap their mind around a new worldview and a mind-bogging threat, and learn to master powers in a matter of a few weeks. Also, Roan was too angry. She keeps justifying violence with vengeance, which never appeals to me. 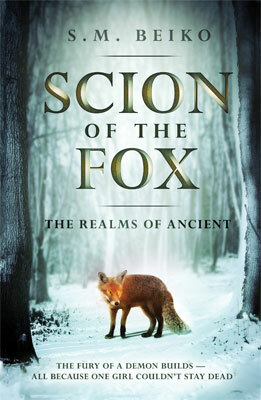 However, my main disappointment with Scion of the Fox was the plot. Although it starts well and strong, especially with an impressive and scary scene involving Roan’s eye and Death appearance, the unfolding of the story is chaotic. There is a sense of urgency in the book, but also frequent sudden ellipses that broke the momentum. Also, it looked like some ideas were dropped along the line. For instance, Roan receives a threat that there would be one murder a day till she surrenders, but this seems to be forgotten quickly after the few first victims. Furthermore, many elements were fairly predictable, including the nature of the Fox and the unconvincing almost-romance that Roan develops at the end. Yet, what wasn’t predictable was the ending, which was utterly, utterly disappointing. Not only didn’t it make sense to me at all, but it also denied everything that had happened previously in the book. Actually, it wasn’t just a disappointment, it was frustrating: I felt fooled. All in all, Scion of the Fox was an interesting read with lovely characters and a strong world-building, however the plot wasn’t very well articulated and paced. The ending unfortunately dragged the whole book down for me, as it didn’t seem to belong and felt like a bad joke on the reader.